Filigree typically refers to the finer elements of craftwork, the parts that are subtle; this Filigree anthology contains work that plays with the possibilities that the word suggests, work that is delicate, that responds to the idea of edging, to a comment on the marginalization of the darker voice. 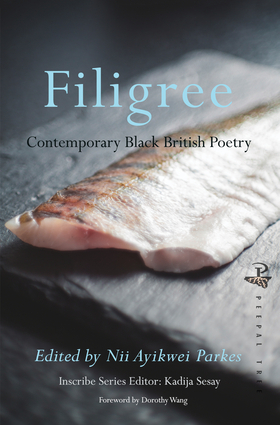 Filigree includes work from established Black British poets residing inside and outside the UK; new and younger emerging voices of Black Britain and Black poets who have made it their home as well as a selection of poets the Inscribe project has nurtured and continues to support. Nii Ayikwei Parkes is an author and performance poet who has performed on major stages across the world. Nii is the Senior Editor at flipped eye publishing, and a contributing editor to The Liberal. Dorothy J. Wang is an Associate Professor in the American Studies Program at Williams College.